I never thought I’d see the day. The day I paint a 29 week baby bump with two precious identical twin baby girls inside kicking and moving around causing my dear friend Kelli to have contractions as I brush sunshine yellow paint over her belly button and around and around until I covered most of the surface area of her tummy. “Kelli’s Belly” I like to call it. It looks just the same as any other pregnant belly I’ve ever seen, but inside there is something VERY unique. Baby “A” Ashlyn and baby “B” Brielle” are an extremely rare set of “momo” twins, so unique that it happens 1 in every 10,000 twin pregnancies. The term momo stands for Monamniotic Monochorionic Twins – Which from my understanding means they share the same embryonic sack which although sounds cuddly and cute, it makes the pregnancy very high risk. Kelli and her husband Jeremy made the decision along with their doctor to move Kelli into the care of medical professionals 5 weeks ago. Her goal: to make it to 32 weeks which makes the magical date for the girls to make their grand entrance – September 10th! While the family anxiously awaits their arrival, memories are already being made. Jeremy will forever have stories to tell about sleeping in the hospital issued “dad chair” and Kelli, well Kelli is experiencing more than the average mama ever will. But I truly believe God only gives you what you can handle and I know Kelli might be cringing as she reads this, BUT girl, it’s the truth. You are already showing your girls how a little faith and A LOT of strength and love can get you through anything. Naturally, I was honored when Kelli and I decided to do a twist on my traditional Breasties painting, to sort of commemorate her time spent carefully nurturing her baby girls under the close watch of the nurses in the Perinatal Special Care unit at Kaiser Hospital, the very place Kelli herself was born. With the help of her family, friends and wonderful hubby Jeremy, Kelli has made her 4th floor corner room stay as close to “home” as possible. Photos of their pug pups Phil and Norman are on a shelf surrounded by diaper bouquets, tiny baby socks, cards and tokens of love. A photo of the happy couple sits framed in one of two windows Kelli has in her room and it’s usually surrounded by fresh flowers delivered by her loving hubby! 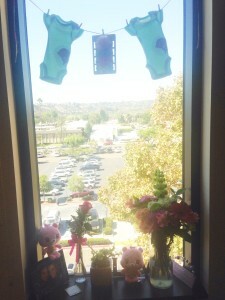 Oh and the best part…itty bitty premie onesies pinned on a colorful yarn clothes line multiply each time I visit. 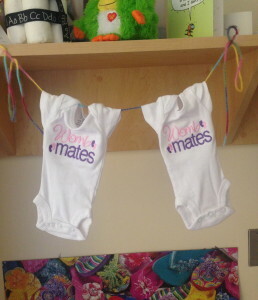 They are the tiniest onesies I have ever seen and the thought of her little “twincesses” (as Kelli cleverly coined during one of my visits) will fit in them is just mind boggling. Today I spent a little more time their than usual, but where else would I be? I had the day off and my friend is going through something very difficult yet so magical at the same time. It’s a roller coaster of emotions – the kind of roller coaster that gets up to the top and then sits there and makes you wait and wait and wait to hit the gas and have some fun. Kelli is right there at the top…so close to the wild, crazy fun ride called motherhood. I want so badly for her, Jeremy, Ashlyn and Brielle to get there and I know they will, but gosh if I can be this anxious about it, I can’t imagine how Kelli must feel. Thank you Kelli for being my first Breasties Baby Bump and for sharing your mama-hood journey with me! Love you Kelli, Jeremy, Ashlyn and Brielle! !